Massive volume depicting the adventures and whatnot.. of an american undercover spy in Franco's Spain who, surprise!, ends up married into the spanish aristocracy, mixing with the "grandes" de España and all of Europe's big names (the Windsors, the Rothchilds, etc etc), amazingly managing to retain "ahem" her position as.. er.. a... "spy" (har har! not even she could quite believe her own stories, I bet!) and in the meantime giving us a spicy, juicy bit of backstage gossip from the 20th-century centres of power which, who cares if half of what is told is made up or not, turns out to be quite entertaining. I loved Aline's books on her spy adventures during and after WWII and I was really looking forward to reading this memoir of what occurred in the years between. While the history and charm of Spain was very evident in the book, it was so poorly edited (and possibly translated) with strange sentence structure and abrupt shifts of subject matter that it was a difficult read. This is a shame. If a proper editor took a look at the book and made some adjustments and corrected spelling/punctuation/structure, this would be an excellent read of a time past. 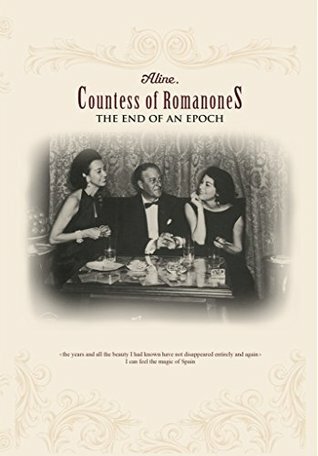 Aline, Countess of Romanones - Doña María Aline Griffith Dexter, Countess of Romanones, Grandee of Spain (born Pearl River, NY, 1923) is an American married to a Spanish aristocrat, socialite, writer and spy. She married the Count of Quintanilla in 1947 and they later became the Count and Countess of Romanones. Aline was born in 1923 in New York, was working as a model when she was recruited to become an OSS agent in Spain where she met and married her late husband. She lives at Pascualete, the country estate of her husband's family, which she painstakingly restored.